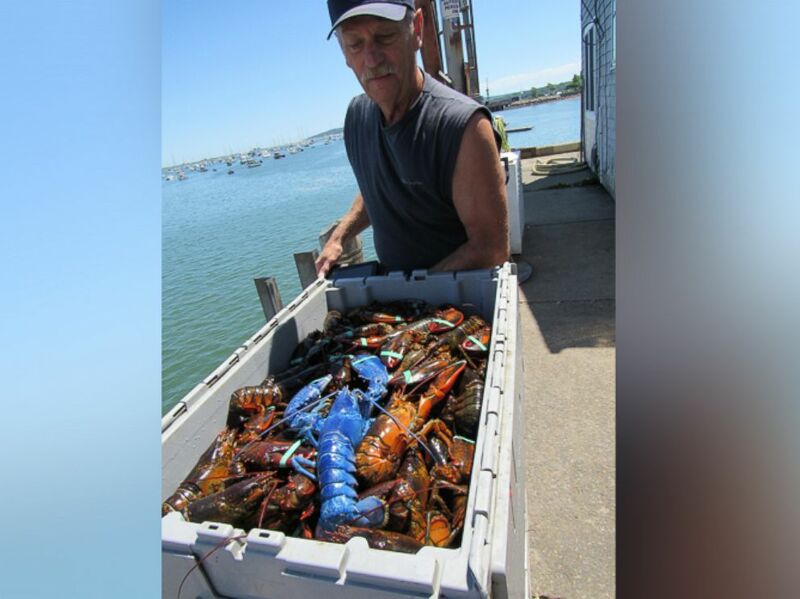 A lobsterman got a major surprise when he caught a bright blue lobster during a fishing trip. Wayne Nickerson is a commercial lobsterman from Plymouth, Massachusetts, and was behind the wheel of his boat when the lobster's incredible color caught his eye. ABC News reports that the first thing he did was call his wife, telling her to meet him at the dock as soon as possible. Blue lobsters are an incredibly rare find, according to Fox News. The color is caused by a genetic defect which leads to an over abundance of a protein that causes a blue hue. Only 1 in every 2 million lobsters are estimated to have the defect. Oddly, this is Nickerson's second time catching a blue lobster. The first time was in 1990, according to ABC. The lobster, which Jan named Bleu, is now being held in a special tank, isolated from other lobsters that could possibly hurt it. The couple hopes to donate Bleu to a local aquarium so others can marvel at its beauty. "We want people to be able to see him," said Jan. The New England Aquarium in Boston called Nickerson's find "just spectacular," and said it would take the lobster if space permits, according to Fox News. While blue lobsters are rare, it's apparently even harder to find lobsters that are bright red -- while they are still alive -- or yellow. Only 1 in 10 million lobsters are naturally red while 1 in 30 million are yellow, according to the Lobster Institute at the University of Maine.